Like every mom, I’m multidimensional. I work hard as a writer, guitar teacher, and parent. And I like to stay up late and enjoy live music as much as I like to wake up at the crack of dawn to try a new fitness class. One of my greatest loves outside of mothering and music is running competitively, which I am now enjoying again for the first time since recovering from back-to-back pregnancies. And as a long-distance runner, I experience a LOT of aches. More often than not, these aches are worse than the cramps in my arms and legs post-gig, after I’ve wielded a guitar for an hour onstage. But the smell of Bengay and desire to keep toxic chemicals off my body (so my young children don’t accidentally inhale or ingest them after a cuddle session), usually means I have to wait out the aches instead of treating them with a topical remedy. Fellow rockmommy/drummer Trish Naudon Thomas and her husband Chris Thomas, parents of 6-year-old Myla Sol, must’ve felt the same way when they created Good Body Products. The family of three, who relocated to Southern Vermont shortly after Myla Sol was born, have channeled all their creative energy into a line of all-natural skin care salves, creams, and tonics that are ready-made for super-active types like me. Recently, I opted to try a bunch of Good Body Products’ therapies — selected as part of my “one of each” bundle(a huge value at $75) — shortly after I interviewed her on balancing motherhood, music (she and Chris’ band The NATCH! recently finished a string of gigs), and a new startup! I’ve never used anything but Bengay on my muscles, so the idea that a natural pain “salve” could work raised suspicion. I’m happy to say that the salve — a thick skin cream that feels like a slightly granular version of an everyday ointment — ended up being the best of the bunch. I rubbed it generously on all of my muscles after a recent half marathon and felt like my old self (sans massage!) in about two days. I love body butters — they feel so luxe and indulgent. My ankles and elbows are super dry, so I was psyched to try Good Body’s version. The lavender-infused scent was nothing less than intoxicating, and the cream did a great job of softening my dead ankle and elbow skin. The only weird side effect is that every time I use it at night, I experience strange dreams (perhaps that’s a byproduct of St. John’s Wort’s depression-easing effects?). I’ve never really used mists, so it was a shock that out of all of the Good Body loot I received, I ended up feeling most attached to the Rosemary & Lavender Aromatic Mist. I now spray it everywhere (my hair, my kids’ clothes, the toilet seat) and anytime I need a mood lift (lavender is, among other things, a well-known mood booster). I’m a huge fan of sugar scrubs because they’re softer on my skin than salt scrubs. This one comes with a light, sweet scent, and the oils left my skin feeling smooth (since I’m acne prone, I couldn’t apply as liberally as I’d like, however). Good Body’s perfectly packaged patchouli-lavender solid perfume immediately reminded me of the Grateful Dead-loving dude I dated in high school. Patchouli carries so many other memories for me, too — Madonna’s “Like a Prayer” cassette tape (yes, Madonna made a patchouli-scented record, for all those post-1989 kids who didn’t buy it), sneaking out with boyfriends who wore Doc Martens, and 1990s rock shows. Few things are grungier or more rock and roll than patchouli, and the solid scent is a nice way to show it off. Because I’m digging florals like jasmine these days, I didn’t wear this one much, but when I did, the scent lasted for several hours. Overall, I’m convinced that many natural body products are just as good as their synthetic counterparts. As I write this, I am almost out of the spray tonic and joint pain salve (so I’ll have to order more soon, especially if I run another half marathon this fall). And the sugar scrub is long gone. It just goes to show that creative mamas (and papas) can make more than great music in their quest to help (and heal) the world. — Marisa Torrieri Bloom is the founder and editor of Rockmommy. 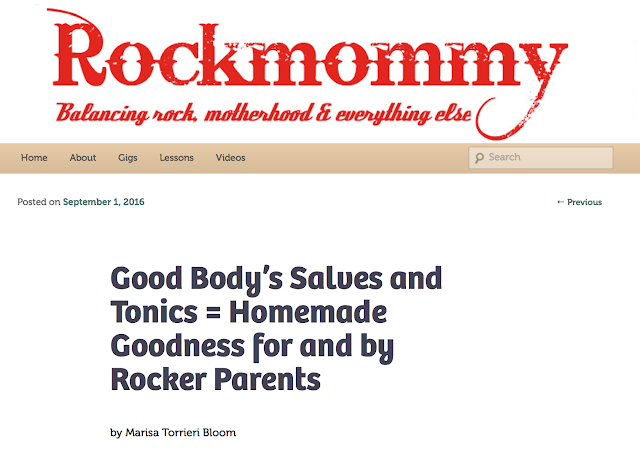 This entry was posted in Rock Mamas and tagged Good Body Products, rocker parents, The NATCH! by rockmommyct. Bookmark the permalink.